Plans to build a multimillion-pound bus station below a new park in Stockport have been given the go-ahead. 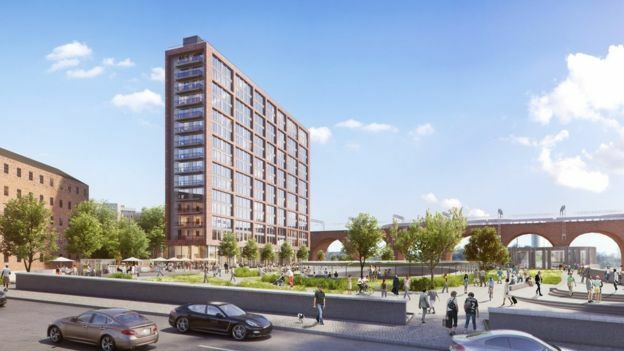 Part of a £1bn investment in the town centre, the plans also include a residential block and an upgrading of a section of the Trans Pennine Trail. They were passed at a meeting of Greater Manchester Combined Authority. The region's mayor Andy Burnham said they "demonstrate a clear ambition" for the town to "become a key urban centre in South Manchester". 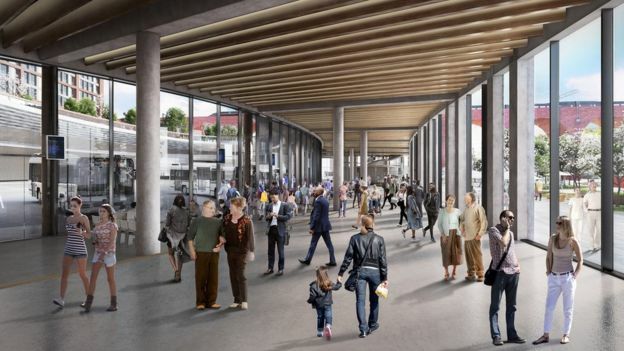 A Transport for Greater Manchester (TfGM) spokesman said the plans included "enhanced CCTV across the interchange", 20 bus stands and a covered concourse for passengers. They would see the Trans Pennine Trail, a route for walkers and cyclists, upgraded alongside the River Mersey and the bus station. 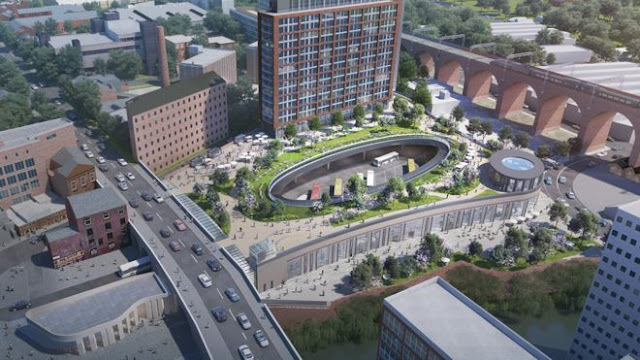 Stockport Council leader Alex Ganotis said it was "such an important project... and will take our transformation of the town centre to the next level". "We believe that the creation of a new park, new homes and modern public transport facilities will all be great additions," he added. Mr Burnham said the proposals were also "a fantastic example of integrated town centre planning, with TfGM and Stockport Council working together to build something that will benefit an entire community".